Kingstons DT Mini Fun can mate? 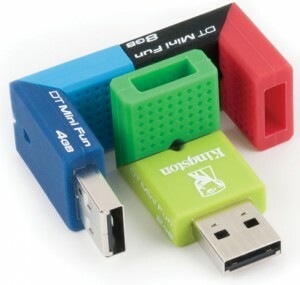 Tired of lugging around that boring flash drive? Kingston feels your pain, and it’s hoping to add a fair amount of “pizazz” and “spice” to your mobile storage needs. One look at the new DataTraveler Mini Fun G2 all but confirms that there’s oodles of joviality brimming beneath the colorful plastic, with a trio of hues to choose from (based on model). These guys can also be connected together for kicks and giggles, with 2GB, 4GB and 8GB models available to bring smiles to the faces of those you know and love. Pricing is set for £4.58 ($7.26), £5.04 ($7.99) and £9.00 ($14) from least capacious to most, with no surcharge to be placed on your favorite color — in other words, bonus fun is provided gratis. Beat that.